“I’d rather meet my last rattle than be reunited with the Heavenly Host." Angels of Heaven beware- everyone's favorite revenge-fueled warrior is back! 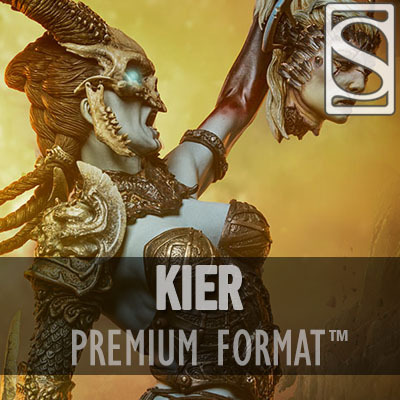 Sideshow is proud to introduce the Kier: Death’s Warbringer Premium Format™ Figure. This new version of Court of the Dead fan-favorite Kier features more armor, more muscles, more rage… and, of course, the heads of her vanquished foes. The Kier polyresin statue is over 21" of pure aggression, from the bottom of her battle-damaged base to the tips of her bloody knuckles. From every angle, this highly-detailed collectible packs an epic story-telling punch. "It’s nice to present Kier in a moment of rage and vengeance,” said Ricky Lovas, Sr. Brand Manager. "Most of our Court of the Dead collectibles thus far have been more museum-like poses, but now that we are getting into second versions of some of the key characters, we can show a little more of their personalities and emotions. The severed angel head is a nice nod to her origin, as well." The Collector’s version of Kier includes an incredibly deluxe special feature: a magnetic mask with its own stand, known as the Valkyrie's True Face. “You have cool little display for her mask if she chooses not to wear it,” said Jesse Lincoln, Project Manager. "This standalone piece really shows off the glory of her mask. It’s a nice little curio for your cabinet." Death’s Warbringer features new, more ferocious armor and custom fabrics that compliment her action-packed sculpt. "Kier's back is exposed in this new version because we wanted to highlight her wings, or where they would have been, to show that no matter what, she is an angel herself," said Designer Rachel Roubicek. "For this version of Kier, we get to show the grittier, warrior side of her,” added Tim Hanson, Cut & Sew. "Her fully-posable skirts have been weathered and shredded to reflect that battle-worn awesomeness." Although angels may be her preferred prey, Kier fights both angels and demons on behalf of the beleaguered Underworld. The Exclusive version of the Kier: Death’s Warbringer Premium Format™ Figure comes with Severed Chaos in the form of a grisly severed demon head, which can be swapped out with the angel head. Kier abides by the ancient wisdom: Two heads are better than one! With its ornate story-telling elements and multiple customization features, the Kier: Death’s Warbringer Premium Format™ Figure is a fierce addition - or start - to any Court of the Dead collection.